Yesterday my girl had a day off from school so we took a trip to the library. I picked up Olivia by Ian Falconer and talked my girl into taking it home. She's a picky reader. I hadn't read it before but I loved the look of that little pig. I think I must have read it to my girl a dozen times yesterday. We both love Olivia! I think what I love most about Olivia is how much she is like my girl. I kept stopping while I was reading to say, "You do that too!" Olivia is quite energetic; she wears her mother out. I've said that many a time to my girl. She loves to dance, dress up and sing very loud songs as does my darling daughter. It's always dinner and a show at my house. The illustrations are simple yet beautiful. My favorite is Olivia imagining dancing on stage. It's adorable. Apparently, there is a whole series of Olivia books and a website. I might be buying the book after we return it to the library. I love Olivia! They are the greatest books. Fantastic that you've discovered her! 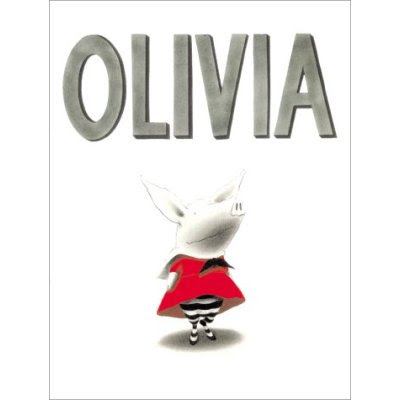 and if you like Olivia, check out Arnold Lobel's SMALL PIG. It is absolutely hysterical and wonderful. You can find the reviews here. Karen- Thanks. I'll add that to the library list. Puss- I read your reviews. Glad you enjoy her too. "You know Olivia? You really wear me out, but I love you anyway." Helen- I love that line. We say it before bed every night now.